Undergraduate UC Santa Cruz students plant lettuce as part of an Environmental Studies organic farming internship at the UCSC Farm. An apprentice in the six-month organic farming program harvests summer squash in raised-bed gardens at the UC Santa Cruz Farm. The apprenticeship is one of the core programs of the Center for Agroecology and Sustainable Food Systems (CASFS) at UC Santa Cruz and has earned an international reputation for the skill and knowledge of its instructors and researchers for more than 45 years. The Center also serves undergraduates and the public, and is dedicated to increasing ecological sustainability and social justice in the food system, while creating the next generation of leaders in sustainable agriculture. This gift, from an anonymous donor, is the first step in building a $10-million endowment that will ensure the Center's long-term productivity and impact. "The Center for Agroecology and Sustainable Food Systems at UC Santa Cruz is the nation's leading university program in sustainable agriculture and food systems," said Daniel Press, CASFS executive director and the Olga T. Griswold professor of environmental studies. "This generous gift will help ensure that it continues to be." The Center and its programs are part of the Coastal Sustainability initiative of The Campaign for UC Santa Cruz. Annual payouts from the endowment will be used to cover costs for salaries, educational expenses, materials, and equipment. Work at UC Santa Cruz in sustainable agriculture and food justice are key components of the UC Global Food Initiative announced July 1. 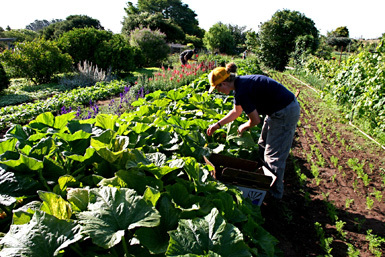 Founded in 1967, the Center operates the three-acre Alan Chadwick Garden and the 30-acre UC Santa Cruz Farm, which serve as research, teaching, and training facilities. 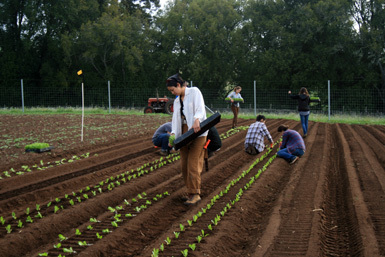 Each April, a new crop of apprentices comes to UC Santa Cruz to live and work on the Farm for six months. This year's 39 first-year apprentices hail from across the country and bring with them a variety of life experiences. They are united by a single passion: to learn how to produce healthy food for their communities and empower others to do so as well. Apprentices get approximately 300 hours of classroom instruction and 700 hours of in-field training and experience in greenhouses, gardens, orchards, and fields. In addition to learning soil science and a comprehensive suite of organic farming and gardening skills, apprentices also study business practices and direct marketing techniques for small farmers. And they gain a conceptual grounding in social and environmental issues in agriculture. The program now boasts nearly 1,500 graduates who have established their own commercial farms and market gardens, organized and run community gardens for inner city and prison populations, and developed school gardening programs. Many graduates take part in international development projects, including programs in Nepal, Uganda, Kenya, South Africa, and throughout Central and South America. Others have raised the standards of the organic food industry through work with certification programs and retailers. The Center and Farm and Garden also serve thousands of UC Santa Cruz undergraduates through more than 30 classes; plus internships, service learning, and campus events. Hundreds of community members visit the Farm each year for organic gardening workshops, events, and tours. Finally, the Center advances both theoretical and applied research. Researchers working with CASFS are at the forefront of efforts to develop and advance sustainable food and agricultural systems that will serve as a foundation for future generations.